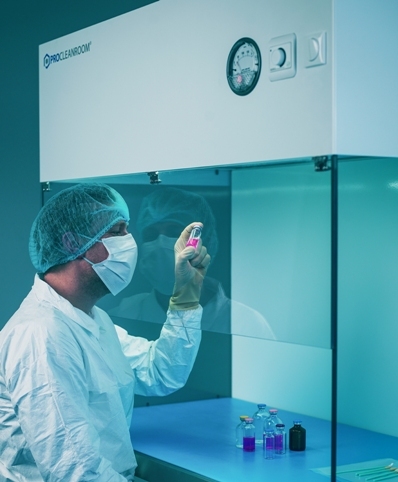 ProCleanroom always works with its customers to create the best possible solutions. With the VLFU series in four standard sizes, it offers a range of high-quality laminar downflow units (clean benches). The flow cabinets generate a vertical flow (downflow) to provide product and process with protection against contamination within the flow cabinet. Within the flow units, a clean working environment is realised, free from micro-organisms and dust particles. Depending on the selected filter type (H14 or U15), the downflow unit realises, an ISO class 3 to 5 working environment (ISO14644-1). The VLFU series laminar downflow units by ProCleanroom are ideally suited for industries where product or process protection is needed. Think of high-tech, electronics and medical industries, research institutes and laboratories. By placing the laminar flow cabinets from the VLFU-series in the environment, within an ultra-clean micro environment is created. Within this environment, critical processes (such as sampling, cleaning, packaging, etc.) can be efficiently performed. The engineers of ProCleanroom guarantee a professional installation on site. After an extensive ISO validation, customers will receive a validation certificate of quality. For periodic inspections, service and re-validation of flow cabinets, ProCleanroom is the ideal partner.